Part memoir, part self-help for teens, this book tells the story of how obsessive-compulsive disorder (OCD) dragged the author to rock bottom - and how she found hope, got help, and eventually climbed back to a fuller, happier life. Using anecdotes, self-reflection, guest essays, and thorough research, Dotson explains what OCD is and how readers with OCD can begin to get better. With humour, specific advice, and an inspiring, been-there-beat-that attitude, readers will find the book simultaneously touching and practical. People with strong obsessional doubt and fixed, overvalued obsessional beliefs are often resistant to cognitive-behaviour therapy and difficult to help. In over ten years of clinical practice with people with obsessive-compulsive disorders (OCD), it became clear to the authors that current cognitive explanations of such disorders are often incomplete. Their book presents an innovative approach that brings together reasoning research, philosophy of mind and language, and cognitive therapy to understand OCD. It outlines the development and validation of an inference-based approach to treating OCD, which addresses the inductive and often imaginary narrative leading to obsessional inferences. Clinical psychologists, psychiatrists and other mental health workers will find this book of great interest. Also included is a complete treatment manual of inferential based therapy (IBA), together with an appendix of supplementary treatment cards for the client that are available online. Offers a simple and engaging program that can get anyone with mild to moderate OCD started on the road to recovery. Beginning with a crash course on what OCD is and what it is not this book teaches OCD sufferers to think realistically about their condition and how it is likely to change over time. Proposes a three-part program for recovery that uses safe and gradual exposure to distressing thoughts and situations, mindfulness practice, and techniques to restructure thinking. Additional chapters address shame and blame, depression, and maintaining progress. Obsessive compulsive disorder (OCD) is the term given to a condition characterized by recurring obsessive thoughts or actions. These thoughts or actions are involuntary and are often a response to a deep-rooted fear. This introductory book, richly illustrated with case examples, explains the nature and treatment of OCD in children and adolescents. OCD has been little discussed in relation to this age group, although it is now believed that approximately 1 per cent of all children and adolescents suffers from serious obsessive disorders. Written for parents and relatives as well as doctors, teachers and other professionals working with this group of patients, From Thoughts to Obsessions defines OCD and forms a straightforward explanation of the symptoms, assessment procedures and treatment strategies. Per Hove Thomsen also examines obsessive features which may form part of normal adolescent development as well as the relationship of OCD to other psychiatric conditions. Completely revised and structured to mirror the steps of cognitive-behavioral therapy, the most effective treatment for obsessive-compulsive disorder, this engaging workbook offers specific strategies for changing the thoughts, feelings, and behaviors that keep OCD alive. The book contains basic information about OCD-its definition, cause, and symptoms-and a brief overview of treatments available for the disorder. 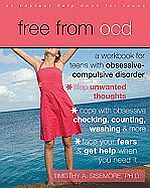 After these introductory sections, the book focuses on ways readers can foster a healthy relationship with someone with OCD. It includes tips for increasing family involvement, making accommodation for the disorder in daily life, and creating an action plan for change using family contracts. The book also covers relational topics such as parenting and marriage, self-care, and support networking. Throughout, the book illustrates important points with the real-life stories of families living with OCD. Aged 15, Devon Brown won't eat in the school caf (a germ swamp). He covers his hands before opening doors, eats things in groups of four (his lucky number), and hangs up his shirts (with all their buttons buttoned) by colour. Some kids say Devon s crazy, but he knows better. These are the tricks that keep bad things from happening, and he can't imagine giving them up. Devon calls it controlling things. His doctor calls it obsessive-compulsive disorder. When Devon starts at a new school, his compulsions start to get him in trouble, and before long he realizes that his only choice is to confront his behaviours and the events that trigger them. In a compelling story of growing up different, the author introduces us to a boy who just might change the way we think about crazy. Sometimes a novel is a useful way to introduce concepts and open up opportunities for discussion. Described in detail are the characteristics of clients who have been treated and how they were treated. Clear summaries of current research findings that relate to both conceptualisation and treatment are provided. Individual chapters describe cognitive constructs that are relevant to OCD - such as magical thinking, intolerance of uncertainty and responsibility � and how these constructs can be addressed in therapy. Examples of case formulations and related treatment plans are provided; these will assist in tailoring evidence-based treatment to the needs of particular clients. Innovative treatment developments, including group treatments and metacognitive approaches, are outlined. How OCD in childhood and adolescence can be treated is discussed. Two complete therapist-manuals, a cognitive-behavioural treatment manual and a metacognitive treatment manual, are included; each has been trialled and published previously in the OCD research literature; each can be used for both individual and group therapy and is accompanied by tips to maximise effectiveness and extensive client resources. * Strategies for contamination, checking, worrisome thoughts, perfectionism, hoarding, and religious obsessions and compulsions. * Use Actions to Beat, Control and Defeat the ABCDs of OCD to effectively conquer symptoms. Obsessive-compulsive disorder is now rated as one of the most common psychological mental disorders. This resource addresses obsessive thoughts as a specific symptom of the disorder, and in addition to self-care strategies, offers information about professional care. Take Control of OCD is a unique guide just for kids ages 8 14 with obsessive compulsive disorder to help them take control of their disorder and find success in school and in life. Using a cognitive-behavioral therapy method to stress gradual exposure to students' obsessive thinking patterns, the book takes kids step-by-step through a ladder-based process to conquer their fears and demolish their worries. Fourteen-year-old Eric is plagued by thoughts that germs on his hands could be making his family sick. Kelly, age 8, feels distressed if she can't count her pencils in multiples of four. No one wants to get rid of OCD more than they do--that's why Talking Back to OCD puts the power to beat obsessions and compulsions in their hands. This uniquely designed volume is really two books in one. The first portion of each chapter teaches children and adolescents skills they can use to take charge of the illness. Instructions that follow show their parents how to provide encouragement and support. Based on the most effective known treatment for OCD, the book demonstrates ways to "boss back" when OCD butts in, enabling many youngsters and teens to eliminate their symptoms entirely. Early-onset OCD is as common as diabetes; this powerful book will help thousands of young people show this unwelcome visitor to the door. Eleven-year-old Sarah is confused, embarrassed, and frustrated by her need to count things but finally talks with her mother and a therapist, who diagnoses Obsessive-Compulsive Disorder and gives Sarah techniques for coping with her symptoms. Includes note to readers. This is the story of Jenny, who suffers from Obsessive-Compulsive Disorder (OCD). It describes how she visits the doctor with her mother, who notices that Jenny is haunted by fears that she tries to keep at bay by tapping the wall with her fingers or by avoiding the white squares of the kitchen's black-and-white-tiled floor. Dr Mike, helps Jenny overcome her fears by showing her how to rethink the "bad thoughts" so that, eventually, she stops dwelling on her fears and realizes that a thought is, after all, just a thought. This is the first book for both children and parents confronting the surprisingly common childhood illness of OCD. It is an excellent resource for parents and for doctors who wish to help children understand their debilitating psychological illness. One in every 100 people suffers from Obsessive-Compulsive Disorder (OCD), and 16-year-old Joe Wells is one of them. In Touch and Go Joe, he tells the story of his battle with OCD from its insidious beginnings at age 9 and increasingly intrusive symptoms, to diagnosis at age 12. Having struggled to keep the condition a secret for years, he is now able to talk and write openly about OCD and how he battled to overcome it. This book is packed with advice and coping strategies, as well as first-hand accounts of available treatments such as cognitive behavioural therapy and medication. Written in an informal and accessible style, and including his own humorous illustrations, Touch and Go Joe gives an upbeat yet realistic look at the effect of OCD on adolescent life. Providing clinicians with evidence-based therapeutic techniques that they can tailor to the needs of individual clients, this state-of-the-art treatment planner is loaded with case examples and clinical tools. The author presents the latest thinking on obsessive-compulsive disorder (OCD) and explains how it has been reclassified in DSM-5. He shows how to combine exposure and ritual prevention therapy with other cognitive and behavioral interventions--based on a comprehensive case formulation--and describes proven strategies for enhancing motivation and overcoming common obstacles in treatment. Giving a full overview of childhood obsessive compulsive disorder (OCD) and discussing all major treatment options, including cognitive behavioural therapy and medication, this guide provides the essential information that families, teachers, caregivers, clinicians and mental health professionals need in order to understand and treat childhood OCD. In this fully revised and updated second edition you'll discover the root cause of your perfectionism, explore the impact of perfectionism on your life, and find new, proven-effective coping skills to help you overcome your anxiety about making mistakes. This guide also includes tips for dealing with other perfectionists and discussions about how perfectionism is linked to worry, depression, anger, social anxiety, and body image. As you complete the exercises in this book, you'll find it easier and easier to keep worries at bay and enjoy life-imperfections and all.